Firefox 5 Benchmarked - Faster And Better Than Ever Before! Officially, Firefox 5 is scheduled for release tomorrow. However, users of the beta channel have already got their hands on it. One of the promises for Firefox 5 is better performance. We took tested Firefox 5 and benchmarked it against two other browsers - Google Chrome and Opera. We used the latest version of Google Chrome from the beta channel and the latest stable version of Opera - Opera 11.11. The result from the Peacekeeper test is very different from that of the SunSpider test. 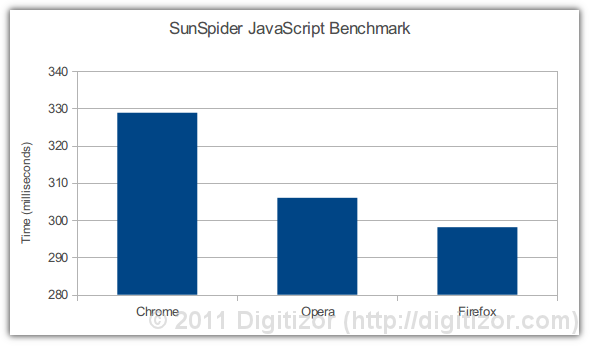 Here, Opera got the highest score while Firefox 5, which did best in SunSpider, performed the worst of the three browsers. 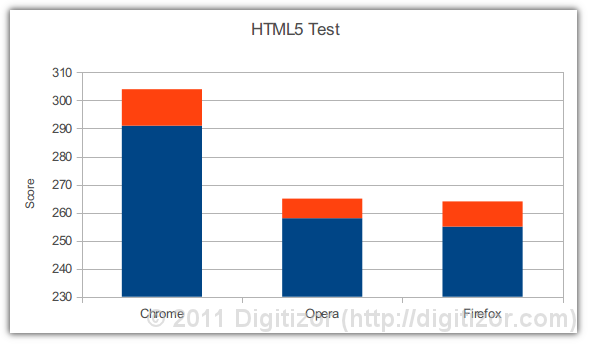 The HTML5 Test is a test to determine how many of the HTML5 and related specifications are supported by the browser. It does not test how well the specifications are supported. Scores are awarded for support of the HTML5 standards and bonus points are awarded for supporting related drafts and specifications. Higher scores are preferred in this test. In this test, Chrome takes the lead by scoring more than 300 points. Opera and Firefox are neck to neck with Firefox scoring 254 and Opera scoring 255. 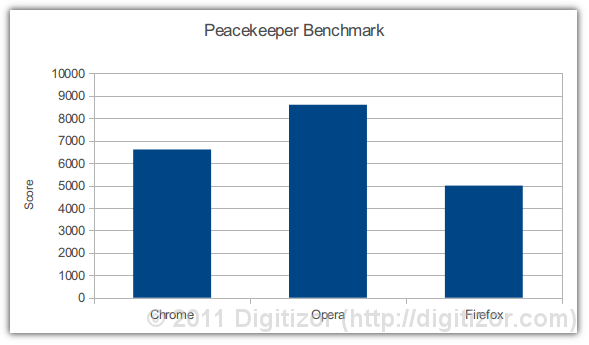 The performance of Firefox 5, is a huge improvement from that of Firefox 4 which manages a score of just above 200. Opera takes the longest time to start here at around seven seconds. 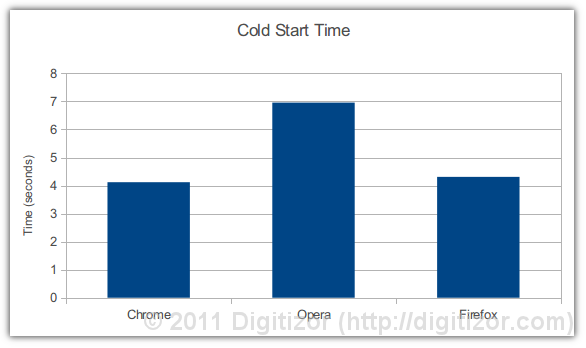 The other two browsers have almost the same cold start time at a little above four seconds. A test for warm start was not done because all of the three browsers have a warm start time of less than a second and it was impossible to time it properly. The result here is staggering. 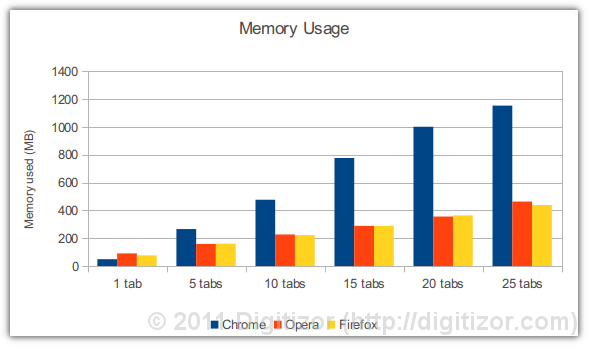 While Chrome takes up more than 1GB of RAM on opening 25 websites, Opera and Firefox takes up a little more than only 400 MB. Firefox and Opera takes up nearly identical RAM throughout, although Firefox takes up a little bit less than Opera. And finally, Firefox 5 takes us minimal RAM even with 25 websites opened.